"Jane lies in Winchester -- blessed be her shade! Glory, love, and honor unto England's Jane!" - Rudyard Kipling, Epigraph to "The Janeites"
Jane Austen was born December 16th, 1775 at Steventon, Hampshire, England. Her parents were Reverend George Austen (1731-1805) rector of Steventon, and Cassandra Leigh Austen (1739-1827). She was the second to the last of eight children and the younger of the two girls. She was very close to her older sister Cassandra, with whom she attended the a boarding school in Reading for two years (1785-1786), her only formal education outside of her family. Within her family Jane learned to draw and play the piano, and formed a love of literature. From the age of twelve to seventeen, she wrote what is now called her Juvenilia, a collection of short stories, light verse, prayers, fragments of stories, and humorous parodies of the literature of the day, for the pleasure and amusement of her family. 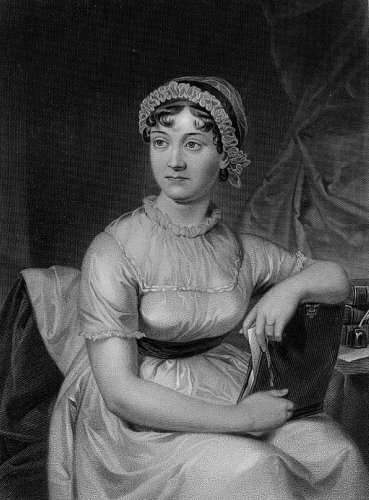 From about 1795 - 1799 Jane Austen began work on early versions of what would become three of her most famous novels. Her father even tried to get an early version of Pride and Prejudice, then titled First Impressions, published but failed. Jane's pastimes were not all literary though. She enjoyed parties, balls, and visiting family and friends. Her family was very close and when her brothers married she often stayed them and their families and enjoyed playing with her little nephews and nieces. In 1800 with the retirement of Jane's father, the Austen family moved to Bath, that great city mentioned in several of her books. Jane Austen had few serious romantic attachments beyond a few flirtations. But it during this period of her life, in December of 1802, when she and her sister Cassandra were staying with the Biggs family near Steventon that Harris Bigg - Wither, some six years younger than herself, proposed to Jane and she accepted. However, the next day she retracted her answer and she and her sister went to stay with their eldest brother James, then the rector of Steventon. Though seemingly not very affected by this incident Jane never married. In 1803 Jane Austen sold her first novel Susan (an early version of Northanger Abbey) to a publisher for ten pounds but he chose not to publish it and it did not appear in print till fourteen years later. She continued writing, though, during the family's years in Bath, one fragment of a novel from that era, The Watsons, still survives. In January of 1805 with the death of her father and a considerable reduce in their income, Mrs. Austen, Jane and Cassandra were largely dependant on the support of their brothers. In 1806 the women moved, from Bath, first to Clifton and then to Southampton which was near two of Jane's naval brothers Frank and Charles. In 1809 the ladies, joined by Martha Lloyd, an old friend and sister-in-law to their brother James, moved to a small house on their second brother, Edward (Austen) Knight's, estate Chawton in the county of Hampshire. Here Jane Austen continued her writing, revising her earlier versions of Sense & Sensibility and Pride & Prejudice. Both novels were published written anonymously 'By A Lady' in 1811 and 1813 respectively, and did fairly well. From 1812 - 1813 Jane worked on Mansfield Park which was accepted and appeared in publication May of 1814 and was sold out in six months. At this time Jane had already begun work on Emma which appeared in December 1815 dedicated, by the express request of His Highness, to the Prince Regent (later George IV) who was a reported fan of Austen's. From 1815-1816, although she was becoming increasingly unwell, Jane wrote Persuasion. It was in early 1817 that she began work on another novel, Sanditon, but had to give it up because of her health in March. By April she had made her will and about a month later Jane was moved to Winchester for medical treatment. She died there, from Addison's disease, Friday, July 18th, 1817 at the age of forty-one. Jane Austen was buried in Winchester Cathedral on July 24th, 1817 and mourned by all her family, including her mother and beloved sister Cassandra. It was not until the end of 1817 that Persuasion and the earlier refused Northanger Abbey were published by Jane's brother Henry Austen. Her brilliantly witty, elegantly satirical fiction marked the transition of English literature from reason to romance. Her way of describing and accurately pin-pointing human nature and events of every-day life makes her one of the greatest writers of all time. Comments by E.M. Forster, Virginia Woolf, Sir Walter Scott, G.K. Chesterton, C.S. Lewis, and Alfred Tennyson, among others. Harsh, but telling words from Charlotte Bront�, Mark Twain, Ralph Waldo Emerson, and even her own friends and family. My favorite Jane Austen links. Mini bios of Jane's brothers and sisters.